Drought Effects on California's Diverse Ecosystems: Several UC Natural Reserve sites in California are participating in the International Drought Experiment and have formed a regional sub-network known as The California Drought Experiment. The experiment is compliant with the DroughtNet protocol for comparison to 100 other sites worldwide. The goal of the California Drought Experiment is to identify commonalities among the ways California’s ecosystems respond to drought, in order to better manage the state’s biodiversity and important functions such as carbon storage. ​Effects of drought on plant growth and biodiversity are being measured at a number of grassland and shrub land sites along a north-south and coastal-inland gradient in California. Drought shelters are constructed of lightweight metal; rainfall is intercepted using clear, v-shaped plastic troughs. Soil moisture and temperature, as well as air temperature and relative humidity near the ground are being monitored under the shelters. Results will help stakeholders plan for future climate impacts in California’s diverse ecosystems. At some sites (i.e., Younger Lagoon and Sedgwick), network participants are also conducting experiments on how drought affects the survival and growth for seedlings of native California plants. This will help us better understand how to restore damaged ecosystems in the future. Numerous student internships and graduate theses are ongoing throughout the California Drought Experiment. We appreciate support from the UC Institute for the Study of Ecological and Evolutionary Climate Impacts. Climate Change at the Sierra Nevada conifer forest - Great Basin Desert ecotone: This research examines the influence of altered precipitation patterns on plant ecophysiology, communities, and ecosystem processes. In arid ecosystems typical of much of the western U.S., water availability affects plant survival, photosynthesis, growth, reproduction, and migratory potential. Experiments are being conducted at the Valentine Eastern Sierra UC Reserve in eastern California, where we have been applying water in the summertime to simulate enhanced levels of monsoonal rainfall that some climate models predict will occur in the southwestern Great Basin Desert in the future. We are also utilizing 55-yr old snow fences constructed by Caltrans as simulations of increased and decreased snow depth scenarios, such as envisioned by some climate change models for the future. Altered snow depth results in more (or less) soil water available for shrub and tree growth in the subsequent spring and summer, effects which can then resonate to higher order processes in the ecosystem (such as litterfall, root growth, soil C storage, and soil N content.) We are also studying community-level responses to snow depth changes. We are measuring natural recruitment of Jeffrey and Lodgepole Pines (Pinus jeffreyi and P. contorta, respectively), as well as Great Basin sagebrush and antelope bitterbrush (Artemisia tridentata and Purshia tridentata, respectively) as a function of snow depth treatment and microhabitat (i.e., shrub canopies vs open intershrub spaces). Wildland Fire and Fuels Management: This work seeks to integrate scientific research, knowledge, and technology to better inform management of wild fire risk. We examine how native trees, shrubs, and non-native invasive plant species are affected by global climate change, atmospheric N deposition, and land use patterns. Much of this research has focused on the population biology and ecophysiology of the problematic Great Basin invasive grass species Bromus tectorum (also known as cheatgrass), where it has potential to dramatically increase wildfire risk for the recreational hub of Mammoth Lakes, California. Fog in America's Salad Bowl: This work seeks to better manage irrigation scheduling in coastal agriculture along California's Central Coast, one of the most productive agricultural regions in the country. We use a multiscale approach to link carbon, water and energy fluxes for leaves, canopies and landscapes. This work is lead by former USDA-NIFA Postdoctoral Fellow, Dr. Sara Baguskas who is now Assistant Professor in Geography & Environment at San Francisco State University. Wavelength-Selective Solar Windows: This work examines the impacts of a new sustainable energy generation method on plants in agricultural and natural settings. Wavelength-selective solar windows use dye-infused materials to capture a portion of the photosynthetically-active portion of the visible wavelengths of sunlight. The energy is wave-guided within glass or plastic panels and directed toward photovoltaic elements annealed to the glass (or plastic.) 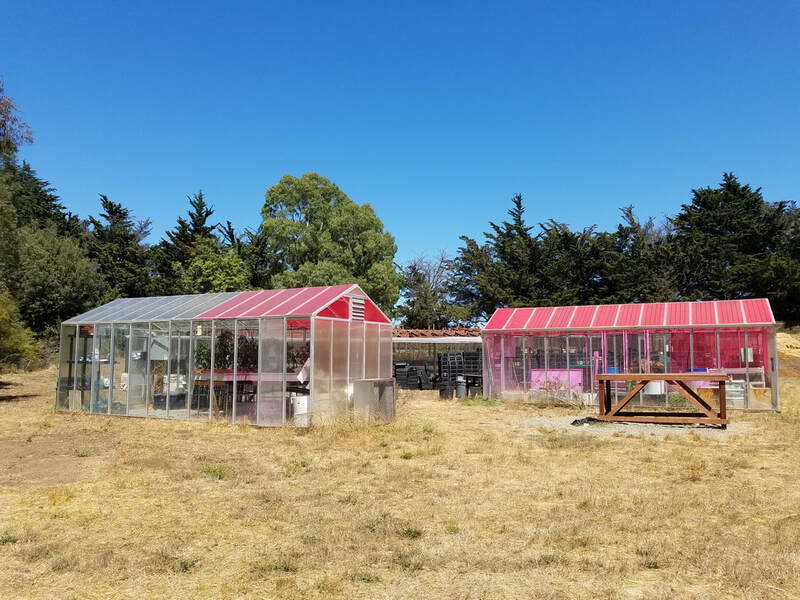 We have built a greenhouse of these windows at the UCSC Arboretum (see below). The electricity generated by the windows powers the pumps, fans, and data loggers of the glasshouse. Future plans will deploy the technology in agricultural fields, coastal grasslands, and native desert habitats to test their impact on productivity, biodiversity and ecosystem processes.